“Sailing into Legend (HMS Pickle)” the original oil painting measures 62 x 47.5 cm [24 1/2 x 18 3/4], available, £5,000., ex studio, ex frame. This painting and “I Have Urgent Dispatches” are the result of an unrepeatable gathering of experience, an unrepeatable time. These pictures have become one of my most celebrated paintings, rivalling my famous “Roaring Forties” painted for Sir Robin Knox-Johnston. 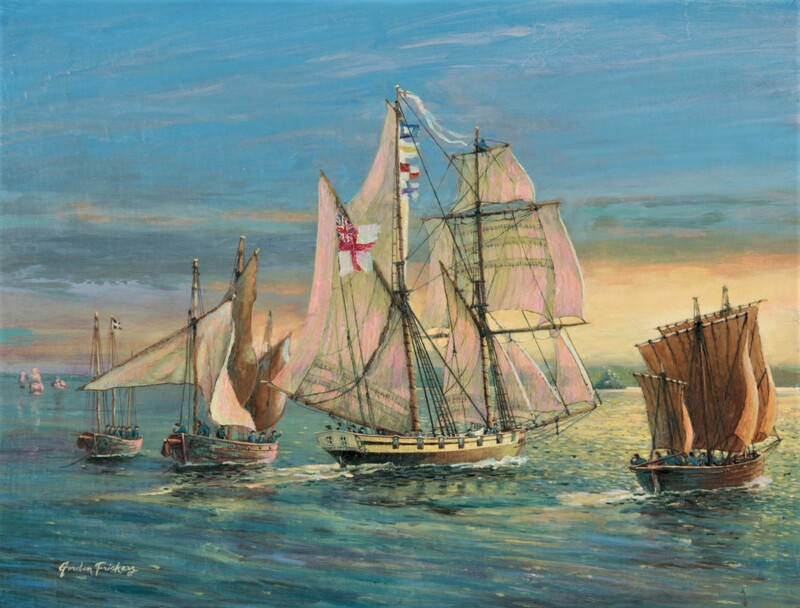 These paintings and the others in my “Nelson and Trafalgar” series are a result of my being appointed ‘Official Artist’ to HMS Victory, to help with increasing public awareness of the ship and raising funds for her renovation prior to the 200 anniversary of Trafalgar. My brief was to paint “lesser known yet interesting subjects”. One I chose was HMS Pickle. This was partly because I felt modern sailors could more easily relate to ‘Pickle’ than a 3 decker. Legend, stoutly supported, denied as fiction, in Penzance, tells us the first place the historic news of Trafalgar was announced was in Penzance, West Cornwall. The news meant Britain was free of the very serious threat of European invasion by 350,00 of Napoleon’s troops, was over. Some academics say there is no proof. They dispute as ‘legend’, the news of Trafalgar was first publicly announced from the balcony of the Union Inn, Penzance, having been rushed ashore by fishermen who had spoken with HMS Pickle as she ghosted out of the night in light airs under all possible sail, bound for Falmouth and Plymouth. 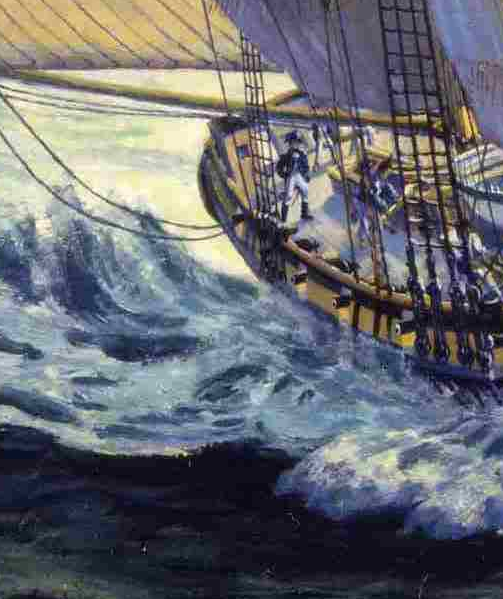 Cornish fishermen in war time would be watching at dawn for French privateers. She had often patrolled their coast,including some sharp actions, she’d made prizes of French raiders. 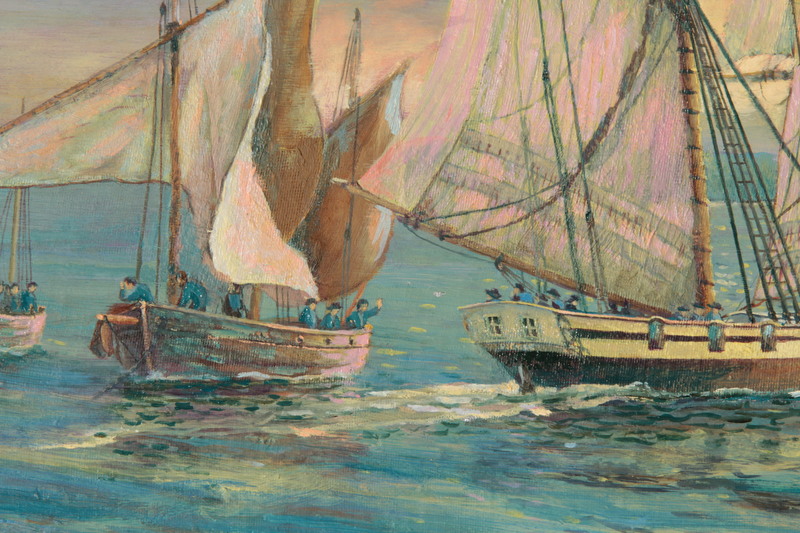 Her crew list suggests the fishermen may even have had brothers and cousins in Pickle’s crew. Cornwall was and is one big extended family. Knowing Mounts Bay, The Lizard, many Cornish people and the HMS Pickle ‘legend’ well, help me set the scene. I lived and worked in West Cornwall for quite a few years, as photographer for the Packet group of newspapers. Later, full time, I studied ship and boat building at Falmouth Technical College before setting up a boat building company; a story in itself, perhaps for another time. My sources for HMS Pickle included the log book of HMS Pickle, and a close study of contemporary illustrations including one likely to have been overseen by Lieutenant John Richard Lapenotiere, her commander in 1805. 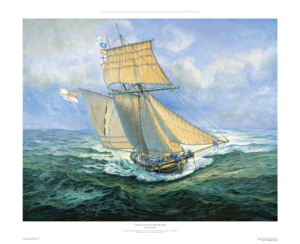 Among those I consulted at length, so we are indebted to, were Dr. Colin White, then head of the Royal Navy Museum, Portsmouth, Mr. Peter Goodwin, then Keeper and Curator of HMS Victory, Pete Goss who built the historic replica lugger “Spirit of Mystery” [he had previously commissioned a spectacular painting of his lugger] and Cornish lugger owners at Looe. At that period I had privileged access to many archives normally closed to the public. 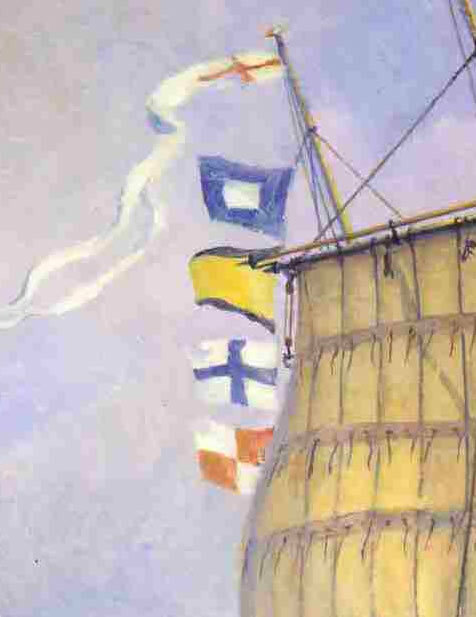 I was able to study British, French, Spanish, Dutch and American schooners of the period. Thanks to Dr. Colin White I was allowed to take the model of a British schooner of war at the RNM Portsmouth, out of it’s case to make a detailed study and photographs. Dr. White, Mr. Goodwin and I discussed the model and my other results at length. Their opinion was the model was not HMS Pickle. They agreed, very similar and a typical British schooner of war of the period. Dr. White said it was built from the plans of HMS Haddock. The model was presented to the RNM by a retired admiral who wished to remain anonymous. 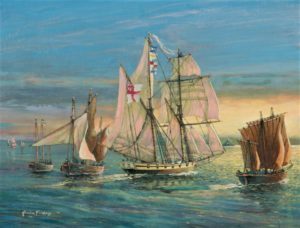 Consequently my paintings of HMS Pickle show the differences we considered appropriate, for example no stepped quarterdeck. Mr. Peter Goodwin, now a distinguished naval author, former Keeper and Curator of HMS Victory, kindly made available dockyard records he discovered at the Public records Office, Kew, detailing her refit in 1803. We also worked together to discover the original colour mix used by Nelson’s captains, known as ‘Nelson’s bright yellow’. Nelson said he chose this colour “because it looked more war like”. His captains copied his style in this and other ways. Later our discovery was further confirm when I was very fortunate to be invited to H M Hydrographic Office, Taunton, a secure government complex.. There I saw an astonishing set of original water colours never publicly exhibited, stored in a dark box the staff called “The Coffin”. 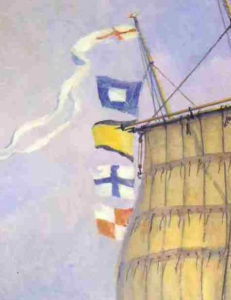 They had been painted at sea as a complete series of the French coast, for navigational purposes, by Serres, official marine artist to HM King George. 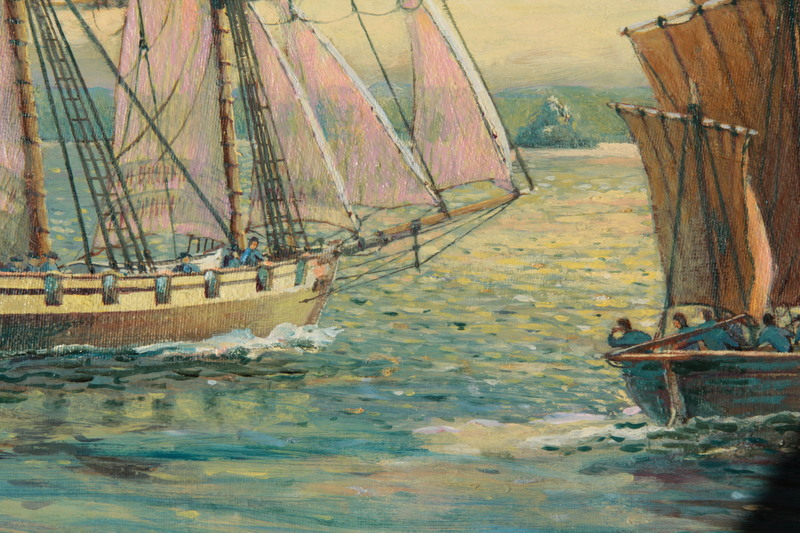 These remarkable water colours include numerous fascinating details including shipping. 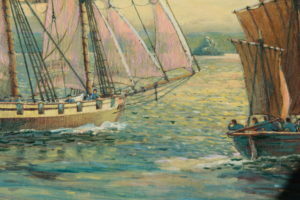 As if that is not enough, I’ve voyaged on large schooners and square riggers. “I Have Urgent Dispatches”, the original is also available. 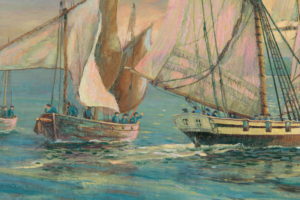 “Pickle” is shown in the Bay of Biscay, racing for home. 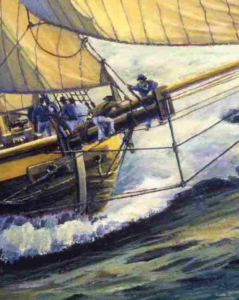 Having sighted a British warship [HMS Nautilus] she is flying 2214, “I have urgent dispatches” [Admiral Popham’s code of 1803, as used by Nelson]. Owned by Victory 2005 Ltd, the original is now considered quite valuable. At present with 4 other ‘core paintings’ from the series, it’s safe in a bank vault in London. The beautiful print is on canvas for the look and feel of the original, numbered, signed. No 1 was presented by officers of HMS Seahawk mess to HRH Princess Anne at a mess dinner in appreciation of her able assistance with the 2005 re enactment of ‘Pickle’s voyage into history racing home with the original Trafalgar Dispatch. I was told several admirals were present [ they sang for HRH … ] and HRH was “over the moon” with her gift. The current owner of the Pickle replica is among those who have a copy. You could possibly acquire one or both. If you think I can be of further assistance don’t hesitate to ask.